Go to Apple App Store and Google Play Store and download the TriviaMatic app. It will be your most important tool to run trivia events at your establishment. As soon as you sign up as a player, you gain a host role. Now you are ready to try out trivia games at your place. The demo game will help you to see how it flows and get acquainted with some of our content. You can also download our detailed guide on How to Host the Game. It is free to upgrade to a business account. 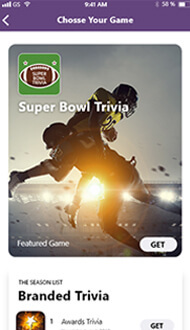 By doing so you basically register your bar or restaurant as a trivia night venue inside the app. You fill in information to your business profile and gain an Admin role to start running your trivia business with us! You can enhance the experience of the players by displaying the questions of the game on a wide screen TV. Having a handheld microphone in your possession prevents your host from shouting out during the event.